A cartoon posted on the Facebook page of Hamas MP Mushir Al-Masri shows the attackers, dressed as orthodox Jews, exclaiming "Where are they?" Four rabbis in an act of worship, in their house of God, slaughtered in the name of Allah. And if the savagery of the act was not enough of a shock, one response from a Muslim on Twitter was equally gruesome. Responding to my tweet about the Jerusalem slaughter, he welcomed the mass murder by writing a single word, "Bravo". 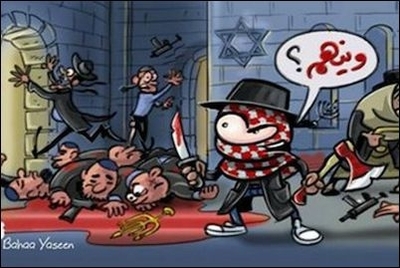 Elsewhere on social media, Palestinians in Gaza circulated cartoons using the image of the meat cleaver and knife used in the attacks, to mock the Jews. As a Muslim who has spoken all my life for the rights of the Palestinians to a state of their own, I was left holding my head in despair and shame. Just an hour earlier, I had read news of my co-religionists killing four Christians in random acts of revenge in the Kenyan city of Mombasa. What have we become, I asked myself? The irony is the Jews murdered were from a sect that poses no threat to Muslims or Palestinians. They are against the very idea of Jews ascending the Temple Mount to pray, an issue that has become a bone of contention in recent weeks between Jerusalem's Muslims and Jews. The Ultra Orthodox Jewish population of Israel is exempt from Israel Defense Force (IDF) service so they can spend their days studying Torah. These were simply men of religion, killed not for what they did, but for who they were — Jews. So it wasn't as if these four rabbis were in IDF uniforms, from one of the Israeli settlements inside the West Bank, that the Palestinians protest is a provocation to them. No, these were simply men of religion, killed not for what they did, but for who they were — Jews. As for the reaction of many Muslims in the West, who woke up to see another atrocity committed in the name of Islam, expect their voices to be channelled through the standard script of many Islamic groups, who will come forward with cliché-ridden denunciations of the act and condemnation of terrorism. However, few will admit the atrocities we now see every few weeks are part of the Islamic tradition of jihad and intrinsic to the belief of how Jews should be punished if they are engaged in warfare with Muslims. Few will, or have, renounced the doctrine of armed jihad as inapplicable in the era of nation states and international law. The biography of Prophet Muhammad, "the Sira" is considered the authentic story of his life and is part of the Islamic faith, together with the Qur'an and Hadith. According to the Sira, in the year 627CE, after a Jewish tribe surrendered to the Islamic army in the city of Medina, Prophet Muhammad personally beheaded 600 to 800 Jewish adult male prisoners of war, thus laying the template of dealing with Jews caught in battle for all times. In my book, The Jew is Not My Enemy, my research suggests the story is a creation of later Muslim kings, 200 years after the incident. These were men who crafted a backdated precedent to justify their own murderous acts. But my view is almost universally rejected. If Islamic leaders are unwilling to critically examine and question the authenticity of the texts they hold sacred, they had better be prepared to see the world react with contempt, if not an unpleasant backlash.